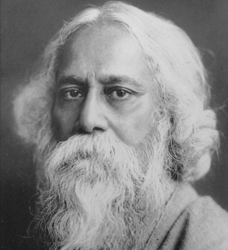 Rabindranath Tagore was a rare and great personality. He was a scholar, freedom fighter, writer and painter and above all a humble man. His contributions to Indian Literature was immense. He won the nobel prize in 1913 for his collection of well known poems 'Gitanjali'. Tagore was born on May 7, 1861 to Debendranath Tagore and Sharada Devi at Jorasanko in West Bengal. He did his schooling in the prestigious St. Xavier School. He has written thousands of Poems and lyrics and about 35 plays about 12 novels, numerous short stories and a mass of prose literature. He was called as 'Vishwa Kavi'. Besides the famous ' Gitanjali' his other well known poetic works include ' Sonar Tari', 'Puravi', ' The cycle of the spring', ' The evening songs' etc. The names of his well known novels are: 'Gora', ' The wreck', ' Raja Rani', ' Ghare Baire', ' Raj Rishi' etc. ' Chitra' is his famous play in verse. ' Kabuli Wallah' and ' Kshudita Pashan' are his famous stories. In 1901, he founded the Vishwabharati University- earlier known as Shantiniketan at Bolepur in West Bengal. This was founded with the aim of evolving a world culture, a synthesis of eastern and western values. Our National Anthem 'Jana Gana Mana ......' was written by him.